Action water sports are my favourite to shoot! The water, and it’s movement and flow, just gives the image an extra dimension which adds that extra bit of interest for the viewer. Being an adventure sports photographer, covering a number of the big sports events around the country, I have been lucky enough to develop good relations with some of the top sports personalities. This helps in that you can then organise to shoot at more pleasing times of the day, rather than during the sport events only. 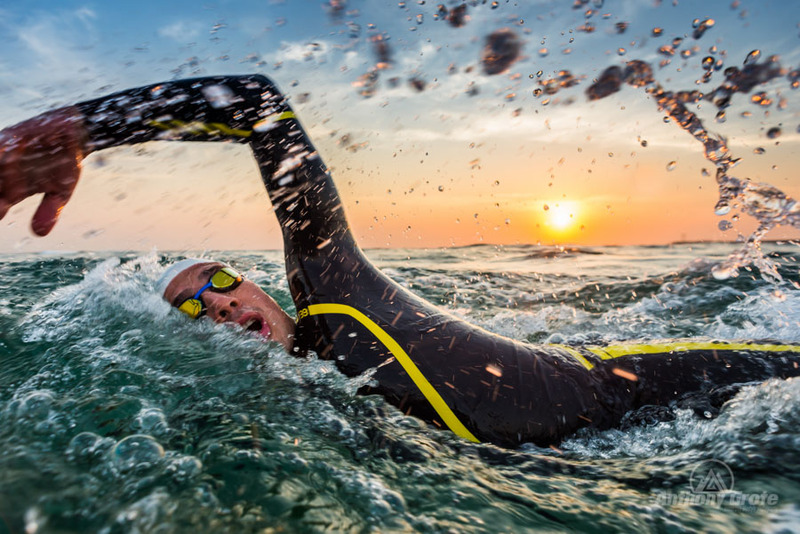 Here Chad Ho and I decided to shoot in the sea before he headed off to Rio 2016 – we decided this as the marathon swim event in Rio would take place in the sea so to get some action shots before hand in the same environment would be great. Shooting in water obviously comes with its hazards and extra equipment is required. Capturing the movement in the water needs some practice, getting to know the sport and movement of the athlete also helps in deciding what shot to get and when to pull the trigger. Here I got Chad to swim from my right to left, with the idea of getting the splash from the swing of his arm during the stroke, with the rising sun in the background. I used a little bit of fill-in-flash so that he would not be a silhouette. Using the flash on my camera housing (to keep the camera dry, of course) resulted in a maximum shutter sync speed of 1/250s, and an f-stop of 5.6 to counter the light and give enough depth of field to keep Chad in focus. ON the counter, the slower shutter gives the little bit of movement in the water particles which help to show the action, this helped with the flash shutter being set on rear-sync. Go out and try, shooting in water is very rewarding! 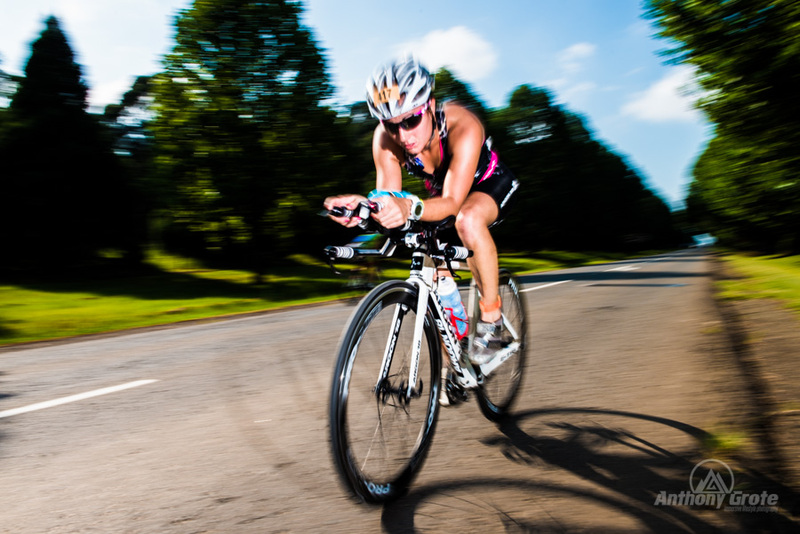 The nice thing about shooting triathlon’s is it gives you lots of time to play and experiment. There are generally plenty of athlete’s taking part and on the cycling leg, the best thing is they are not allowed to slipstream or ride in bunches. So this give you the opportunity to work with your camera and play with settings to get some different images. Ultimately, we can all take a picture of a cyclist riding a bike, but how about doing something different, like showing some movement! In this image I wanted to demonstrate that little bit of movement to show the bikers motion. Rather than a full pan, I wanted just that dash of motion, to blur the background and parts of the bike that are moving fast, while keeping the cyclist, and in particular, their head, in focus (although not sharp, but distinguishable). Maintaining the left to right lead-in, I let the cyclist pass me from my right to left, and then used a slower shutter speed (1/100s f14) and added the fill flash (set to rear-sync) to freeze the motion covered by the flash, thus adding that sharpness to this parts covered. The flash also added light to the cyclist as the sun was on the opposite side of the rider, giving you that rim-light feel.